Tick. The first stage of the armature is done. The main scaffolding structure, including a ‘back iron’ to take the weight, is in place. From this early stage you get a strong sense of the pose; of Emmeline urging women, arm out-stretched, to rise up and demand the vote. But on top of this core metal structure we need to build a more detailed Emmeline in aluminium wire – the clay needs something to cling on to. I wrap wire around her arms and legs and create feet and hands along with woven metal cages for her torso and head, adding polystyrene to save weight. Work also continues on the chair. Making the armature always takes a lot longer than I think. And as I go through the next stages of sculpting the unclothed and clothed figure, I will need to make adjustments. I will also need to make the armature for her skirt and for her hat, but thankfully, not quite yet. 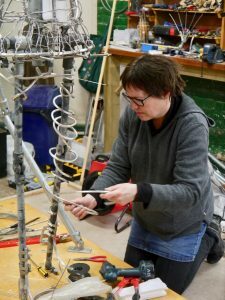 Andrew Simcock, the Chair of the Emmeline Pankhurst Statue campaign, comes to visit my studio to see the complete armature. We are also lucky to have the photographer, Nigel Kingston, documenting the process (see his photos below).